2015 Road Trip Photos #12: Southern Seafood Showdown, Round 1 « Midlife Crisis Crossover! 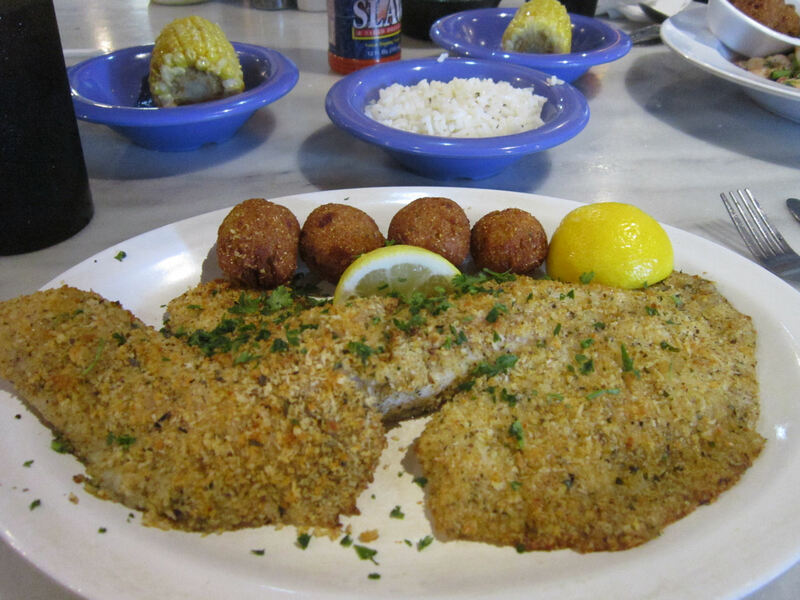 Going into this year’s vacation, we hoped the cuisine would be a highlight at our various stops — be it good ol’ Southern kitchen cookin’, Gulf-sourced fresh seafood, or, really, anything outside of international franchisees. We received our first recommendation from the friendly guide at the Alabama Welcome Center, who insisted that during our road trip we had to try genuine shrimp-‘n’-grits somewhere below the Mason-Dixon line at least once. For lunch on Day Two, I trusted her and gave it a shot. 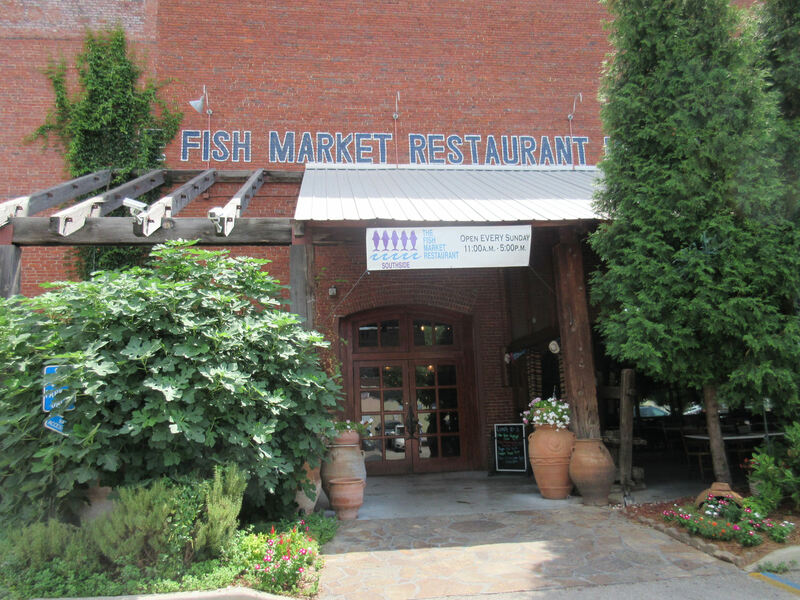 After our long walk around downtown Birmingham, we returned to the car drove and another mile southeast to the Fish Market, which took me a few tries to convince Anne was a real restaurant, not a maritime butcher shop. 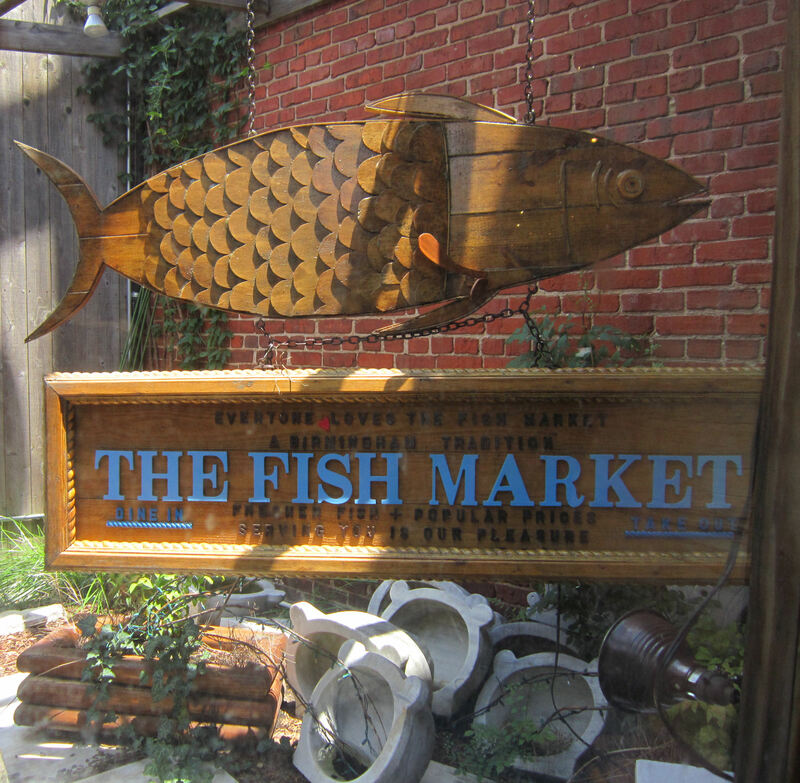 The other tricky part: if you come at it from the northwest, the Fish Market is easy to miss because the side facing 22nd Street South is a featureless brick wall. I drove past it, took a few right turns on Birmingham’s web of one-way streets, and settled for parallel parking a block away. We approached the brick wall that my sources promised was supposed to be the place, walked a long half-lap around, and then found the front door and their free parking lot. 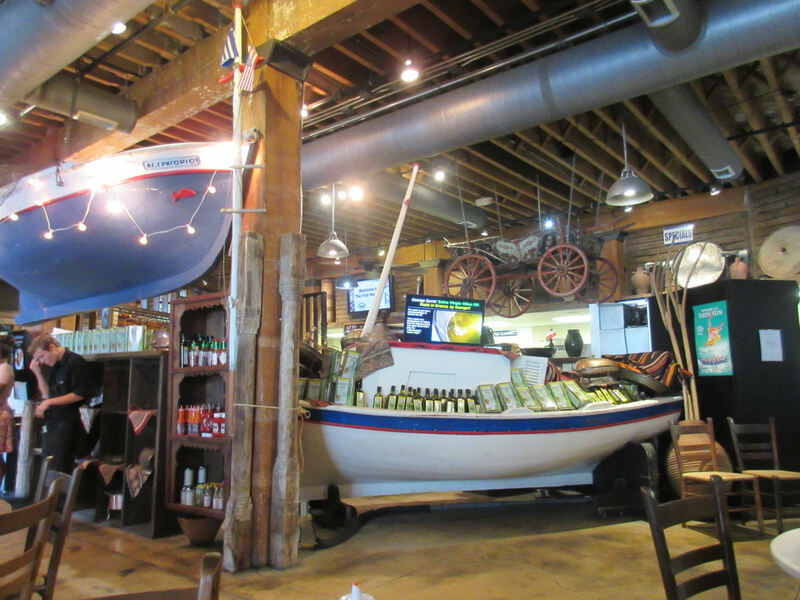 Inside we learned we were both right: the Fish Market is a restaurant and a maritime butcher shop. Stay for a while and order culinary creations, or take home an armload of raw fish and go film your own Chopped episode at home. 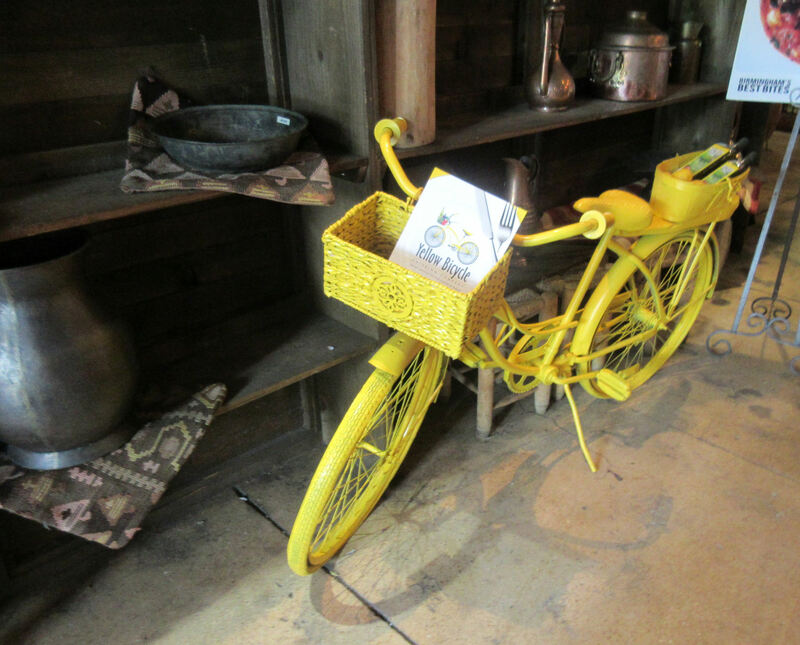 Locals holding special events can also order Fish Market goods through the same owner’s side business Yellow Bicycle Catering. I didn’t look that up till days later and thought this bike decor was some kind of TGIFriday’s homage. 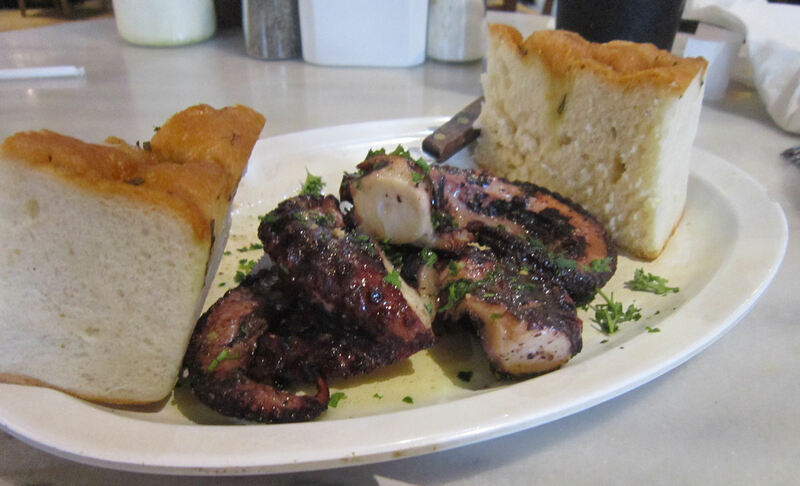 For the appetizer we decided to venture baby steps beyond our limits and tried the grilled octopus, drizzled with Greek vinaigrette. I liked the dressing and can handle a little chewiness in my food experiments, but a couple of tentacles were flat-out burnt. My wife ordered the Panko, Parmesan and Herb-Crusted Cod. They were out of cod. They offered her any other fish of her choice in that format. She panicked, retreated to her fallback position, and blurted out “tilapia”. Ultimately he was fine with it and the portions were generous. The lead photo was my order of shrimp-‘n’-grits. The official menu description: “Gulf shrimp sautéed with bacon, mushrooms and tomatoes, finished with a creamy white wine sauce”. When my plate arrived I was confused at first because we Yankees think of “grits” as mushy, off-white oatmeal. Apparently there’s a cultural translation problem because in many parts of the South “grits” means “cornbread’s fluffier, artier twin brother”. Hence the yellow mesa in the middle of my non-white broth. Taken as a whole, the dish was savory and sweet at once, exquisite and addictive. I wanted to buy an extra gallon for the road, but I guess that’s not a cost-effective option. 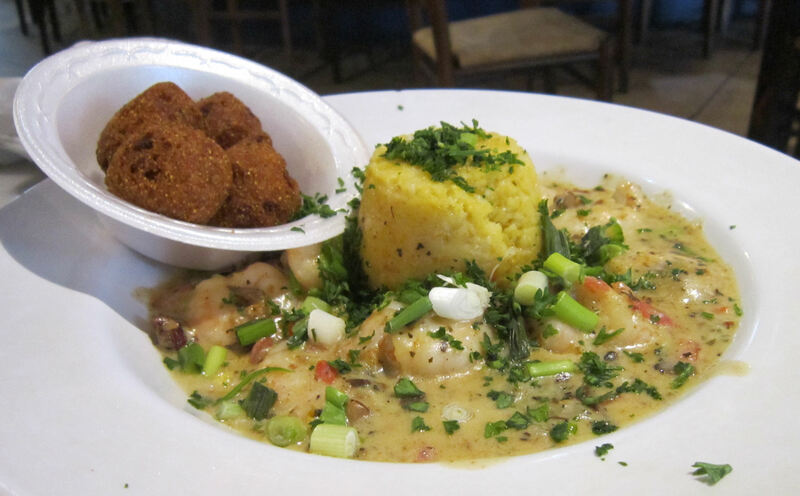 For the rest of our week, the urge to order shrimp-‘n’-grits at every restaurant was tough to suppress. I considered looking up a recipe at home, but I remain skeptical about our personal seafood-prep talents and the freshness of the available materials at our Midwest inland markets. Alas.